To kick off the week, the Reds travel to last year's postseason sweetheart team, the Kansas City Royals for a short, two-game series. The story on last year's Royals seemed pretty clear: they were a decent, not-great team that squeaked into the playoffs and got hot at just the right moment. They got a lot of attention for their ability to leverage their excellent bullpen in the postseason, but the real story, for me, was the explosion of their offense in October, which had been below-average all year (94 wRC+). This year, however, most prognosticators, and most projection systems, expected them to regress back to a 0.500 ballclub. That clearly hasn't happened. The Brawling Royals have instead been an offensive juggernaut, tying the Tigers as the second-best offense in baseball behind the Dodgers by wRC+. They're getting on base, but more surprisingly, they're hitting for extra bases. Aside from one player, their lineup is virtually identical this year to the 2014 team, which posted the LOWEST home run total in baseball. They're slightly better this year in that department, but mostly their extra bases are coming in the form of doubles: they lead the majors with 82. Oh, fun thing: the Reds trail the majors with 38. If there's a weakness to the Royals, it's their pitching. Their bullpen has been superb thus far (by results, at least), but their rotation has been shaky. Some have speculated that they might be a good trading partner for a team that has minimal prospects of making the postseason and viable starting pitching options who are approaching free agency. Anyone know a team like that? About 5 years ago, the Royals had the best farm system in baseball. In fact, it was not just the best, but it was described as "the best farm system in recent memory." Alex Gordon, after several false starts, has turned into a legitimate star. 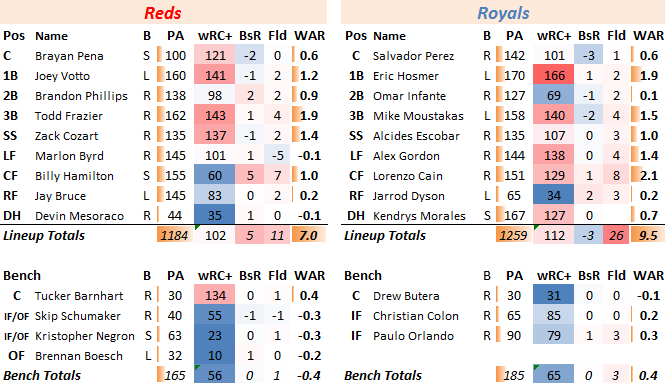 But two of the other cogs in their plan, Eric Hosmer and Mike Moustakas, were starting to look like busts. After a good first full season in 2012, Moustakas seemed to be fizzling, and last year was sent to the minors mid-summer in a desparate hope to jump-start his career. Eric Hosmer was arguably worse. He had a good year in 2013 (3.2 fWAR), but was otherwise a replacement player (or worse!) in 2011-2012, and 2014. This year, however, they've been outstanding. Hosmer is walking for the first time in his career, has a .400+ OBP, is generating tremendous extra base hit totals. Moustakas will probably never be a patient hitter, but this year has shown dramatically improved contact rates and is spraying the ball to the opposite field 50% more often than in prior years. Lorenzo Cain, who is perhaps better know for his defense, is also hitting well, and they've been bolstered by a resurgent Kendrys Morales. The only weak spot in their lineup is Jarrod Dyson, pinch-runner extraordinaire, who is filling in the the injured Alex Rios. I don't know if this will continue, but thus far the Royals have been a legitimately outstanding offense. We only get two games against the Royals, but one, at least, features the fascinating Yordano Ventura. Thus far in his young career, the 24-year old Ventura has yet to post the high strikeout numbers his superb velocity would seem to predict. This year, however, he's shown considerable improvement in his ground ball rate, giving him at least one excellent component. I like him a lot, despite middling results thus far. Jeremy Guthrie, on the other hand, basically just looks old. He's never been a good strikeout guy, but he currently has the lowest strikeout rate among all qualified pitchers. He's also a fly ball machine. Yeah, he doesn't walk anyone. Doesn't much matter with those numbers. If you like high-scoring baseball, the Guthrie/Marquis match-up looks like a dandy. Both teams are currently sporting rather full bullpens due to the fairly restful period in the bullpen. The Royals' collective ERA has been ridiculous. Their peripherals have been less so, though I'm pretty intrigued by what former-Red, doomer-of-Chapman-to-Pen Ryan Madson has done. Wade Davis still hasn't allowed a run, and has been phenomenal. 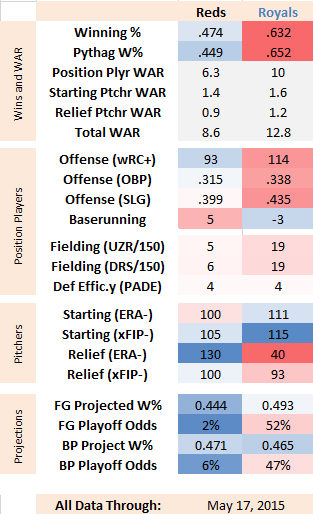 Reds note: Jumbo Diaz is the only non-Chapman reliever with a sub-100 xFIP-...of course, his ERA- has been brutal. He's been pitching pretty well, though, aside from the occasional homer allowed. It's frustrating, as he's getting ground balls at a good rate, and his strikeout-to-walk rates have been phenomenal.